Mangia Bene Mama » Blog Archive » Awesome Garlic Press! 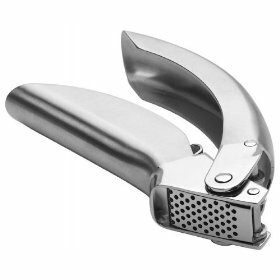 My son and daughter-in-law, Eric & Beth, bought me this incredible heavy-duty garlic press! I love it because you can put the garlic clove in unpeeled…. when you press it, somehow it takes the peel off and gives you a great bunch of garlic with no waste and easy clean-up! It retails for $40, but you can buy it through my link (below or to the right) for just $31 and free shipping! Makes a great stocking stuffer!